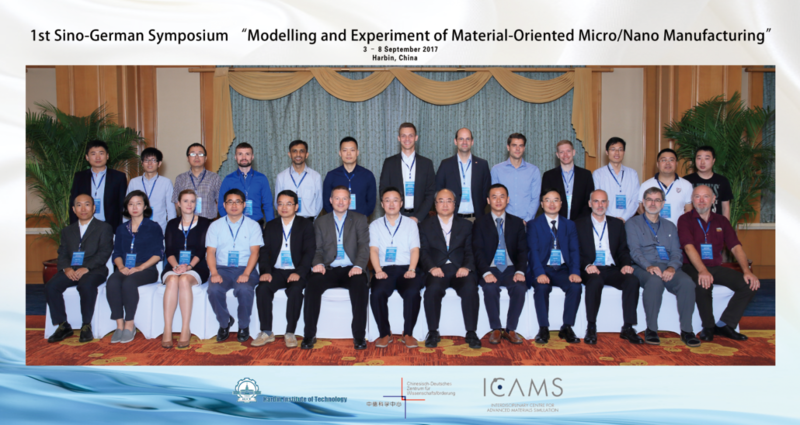 The 1st Sino-German Symposium “Modelling and Experiment of Material-Oriented Micro/Nano Manufacturing”, fully funded by the Sino-German Center for Research Promotion, was successfully held in Harbin, China from September 3-8, 2017. The symposium was co-organized by Ruhr-University Bochum, Germany and Harbin Institute of Technology, China. The chairman from German side is Prof. Alexander Hartmaier from Ruhr-University Bochum, who is also the Chairmen of Germany Materials Society and the Adjunct professor of Chang Jiang (Yangtze River) Distinguished Scholar in China. The chairmen from Chinese side are Prof. Tao Sun and Prof. Yongda Yan from Harbin Institute of Technology. The symposium invites 12 German delegates from Ruhr-University Bochum, Helmholtz-Zentrum Geesthacht, University of Kaiserslautern, Karlsruhe Institute of Technology, Fraunhofer-Institut für Werkstoff- und Strahltechnik IWS, Dresden, Fraunhofer-Institute für Werkstoffmechanik IWM, Freiburg, and TU Dortmund, 1 delegate from University of California, US, and 19 Chinese delegates from Harbin Institute of Technology, Tsinghua University, Fudan University, Hunan University, Southwest Jiaotong University, Shanghai Jiao Tong University, Jiaxing University, Dalian University of Technology, Tianjin University, Beijing Institute of Technology, Institute of Mechanics at Chinese Academy of Sciences and Jilin University. In the symposium, delegates from Germany and China had intensive discussion on the topics of micro/nano fabrication technologies and key components, process analysis and characterization, modeling and simulation, surface engineering, research synergies between precision machining and wear. Meanwhile, delegates visited the Museum and laboratories of Harbin Institute of Technology. The symposium provided an important platform for producing new contacts between scientists from different disciplines of mechanical engineering and materials science, which is of significant importance in establishing long-term cooperation between scientists from China and Germany. Group photo of the symposium.